Athens to Kea Island - 37 nm. Your Athens itinerary typically began the previous day, on Saturday afternoon, when you arrived at the base in Kalamaki to check in, provision the boat (if you hadn't elected to have us do it for you), and receive your pre-cruise chart briefing. Now that you've enjoyed a restful night aboard, possibly taking some time to venture into the historic city of Athens for the evening, it's time to head out onto the shimmering Aegean Sea to sail among the breathtaking Cyclades Islands. Your first stop is the mountainous island of Kea, where you can dock at the main port of Korissia at the south end of Nikolaos Bay or sail to the north end and anchor in seclusion. Nikolaos Bay offers excellent protection from the prevailing summer north winds (the meltemi). There are several other excellent anchorages at Kea as well. Mooring: Moorings are available. The port of Korissia is situated at the south end of Nikolaos Bay, on Kea's northwestern shore. It's a picturesque and quiet harbor, where you can find dockage. The north side of Nikolaos Bay has excellent anchorages, all of them scenic and secluded. On the east coast, you will find a wonderful anchorage at Poleis Bay. Things to do: Renting a bicycle or a motor scooter at Korissia is a great way to explore Kea. Bus service is also available to take you from Korissia to the other villages, including the island's capital, most commonly called Kea Town or Kea Chora. There you will find the ruins of an ancient settlement, a selection of churches and monasteries, and possibly the most noteworthy and certainly impressive site on the island. You walk a short distance to the northeast from Kea Town along a winding path and suddenly come upon the enormous stone Lion of Kea. The creature is 23 feet long and was carved in the 6th century B.C. The Archaeological Museum of Kea is also worth visiting. Just outside Korissia is an ancient acropolis, where you can explore the ruins of homes and temples. Also near the port are five popular beaches. All of them are scenic. Some have beachside bars and cafés, while others are simply gorgeous expanses of golden sand. Facilities: Dockage, fuel, and water are available at Korissia at the south end of Nikolaos Bay. Kea Island to Syros Island - 38 nm. The next leg of your Athens sailing itinerary takes you on a magnificent open-water passage nearly due east to the lovely island of Syros situated in the heart of the Aegean Sea. In the prevailing summer winds, you should be sailing on a fast beam reach or with the wind aft of the beam. After you arrive at the small village of Finikas, enjoying a refreshing swim from your yacht in this idyllic setting is a great way to relax. Going ashore to explore and to dine at one of the restaurants makes for a delightful evening. Syros is the capital of the Cyclades Islands. In ancient times, the port of Hermoupolis (also spelled Ermoupolis) was Greece's principle maritime trading center. Mooring: No moorings are available. Syros has a variety of excellent anchorages, mostly on the west side of the island. Starting at the northwest tip of the island and working south, you'll find Megas Kakkos, Delfino, and Kini bays. The Moorings has a base in Finikas Bay on the southwest coast. Varis Bay, on the southeast coast, is also excellent, and you can go ashore to dine at a traditional taverna. The main port of Hermoupolis on the east coast has an anchorage, but you'll have to put up with wakes from the ferries. Strong northerly winds can create an uncomfortable surge. Nearby Galdaros Island has a very scenic anchorage on the south side. Things to do: Hermoupolis is the cultural hotspot of the Cyclades Islands, a major ferry port and a bustling town. The lovely Miaouli Square is the centerpiece and nearby, in the Cultural Center, is the Archaeological Museum of Syros, which features a beautiful collection of Cycladic art, mostly metals and ceramics, excavated from digs on the island. Many of the items are more than 4,000 years old. The Industrial Museum has numerous exhibits and artifacts depicting the growth of Hermoupolis in the 19th century, after refugees from the Greek Revolution settled on the island in 1821. Renting a car and touring the island's smaller towns and villages is a great way to see more of Syros. The beaches are beautiful and many are secluded. Syros Island to Serifos Island - 30 nm. Plotting a course to the southwest lines you up for a swift passage on your Athens sailing itinerary, bringing you to beautiful Serifos. This lovely island is famous for charming villages along the shores and nestled on the verdant hillsides. Fantastically shaped rock formations, some of which resemble human figures, are fascinating as you walk among them ashore. Livadi and other towns on the island have a variety of restaurants and bars, so dining out and enjoying the nightlife is an option. Mooring: Moorings are available. Anchor in Livadi Bay off the port below Serifos Town. To the west you will find a scenic cove at the very southern end of Serifos, and farther west is sheltered Koutalas Bay, a good anchorage in all but strong southwest winds. Things to do: Going ashore to explore the port of Livadi and nearby Serifos Town is a delightful way to spend an afternoon or early evening. There is bus service from the port to Serifos Town, but it's close enough to walk. The nightlife is lively at some establishments, though generally the ambience throughout Serifos is quiet, which accounts for its appeal to many visitors. There are many places to dine throughout the island. In Serifos Town are four beautiful churches. The ruins of a medieval castle are nearby and fun to explore. A visit to the Archaeological Museum of Serifos and the Folklore Museum is fascinating and will reveal much about the history and customs of the Cyclades Islands. You can also see the inner works of the renovated windmills. In lovely Koutalas Bay, you will find impressive Gria Castle and a Hellenistic white tower. Beaches with waterside bars and watersports are easily accessible. Serifos Island to Kithnos Island - 14 nm. Sailing northward on a relatively short passage to Kithnos and its many snug bays and coves gives you plenty of time to explore ashore once you arrive. Among the many places to anchor are Sandbar Bay and Episkopi Bay a few miles from the port of Merichas. On the east coast of the island, Stefanos Bay is magnificent with its sandy beach. Ambling through the narrow streets of the traditional Greek village of Dryopida to browse in the eclectic shops and to savor delicious local cuisine is a pleasant way to spend an afternoon and early evening. Mooring: No moorings are available. The two main ports are Merichas in a sheltered bay about midway down the west coast of the island, where the ferries come in, and Loutra, on the northeast side of the island. Loutra is about as well a protected harbor as you can find in the western Cyclades. The Kithnos coast has many scenic coves and bays, many of them beautiful and remote. Just a few miles north of Merichas are two bays (Sandbar Bay and Episkopi Bay) with picturesque anchorages and beaches. South of Loutra, about in the mid-coast of eastern Kithnos, is Stefanos Bay, which has a splendid sandy beach. Things to do: Renting a car or motor scooter is a great way to explore the winding roads and sleepy traditional villages of Kithnos. Of particular charm are Dryopida (the former capital) and Kithnos Town (Chora). Both are picturesque with whitewashed homes and colorful painted trim. Dryopida is situated in a small, fertile valley and its center is closed to vehicular traffic, making it a wonderful place to explore on foot. Although it is occasionally closed to the public, if you're lucky and find it open, a must-see is the nearly mile-long Katafiki Cave with its subterranean lakes. While you're in Kithnos Town, check out the small but interesting Byzantine Museum. There are shops, tavernas, cafés, and restaurants on the narrow lanes and around the public squares of both villages. In Kithnos Town, you'll see the ubiquitous Greek windmills, some ancient ruins, and numerous donkeys, which many local residents use to haul goods. Panagia Kanal Monastery perched on a cliff near the small seaside village of Kanala is interesting and beautiful, featuring some stunning murals and a superb view. Facilities: Dockage, fuel, water, and Internet access are available. Bus service is available. Car and motor scooter rentals are available in Merichas. Kithnos Island to Cape Sounion Bay - 28 nm. An Athens sailing itinerary wouldn't be complete without a visit to the Temple of Poseidon, one of the most beautiful historical sites in all of Greece. To get there, plot a course northwest from Kithnos to Cape Sounion Bay. Just west of the cape is a small bay where you can anchor, take the dinghy ashore, and explore the temple of the revered god of the sea. Legrana Bay lies a mile to the west and is much more serene. Mooring: No moorings are available. Anchor in Cape Sounion Bay on the west side of Cape Sounion. Nearby Legrana Bay is a good alternative anchorage. Things to do: Merely anchoring in Cape Sounion Bay and admiring the Temple of Poseidon from the comfort of your yacht is an experience in itself, the quintessential Greece you read about in glossy brochures. Many sailors like to take the dinghy ashore and climb the trail leading up the cliffs to walk through the ruins of Poseidon's grand temple. Sunsets are magnificent, but the view of the coast and the Cyclades Islands in the distance is stunning at any time. Cape Sounion Bay to Athens - 23 nm. The final day of your Athens itinerary takes you on a passage along the coast of the Attica Peninsula, in the Saronic Gulf. To starboard the hills and rocky shore nearby inspire the imagination as you consider all the history of Greece, which is literally with you everywhere you cruise in the Aegean. As the balmy wind fills the sails of your graceful yacht, you will find yourself reveling in the special charm that can only be found in these waters. Arriving back at the base in Kalamaki by 5:00 P.M., you'll have plenty of time to enjoy a sumptuous dinner at one of the restaurants near the marina, a fitting end to a leisurely foray into one of the best cruising grounds on Earth. 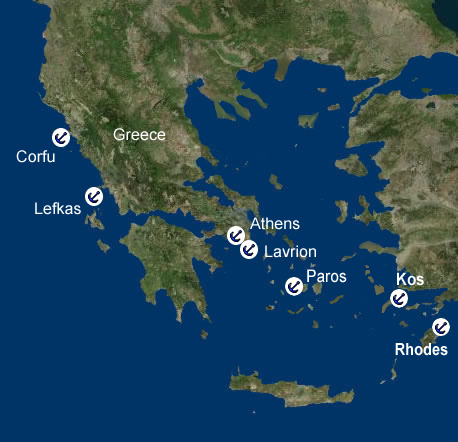 Mooring: No moorings or anchorages are available at Kalamaki. Sailors tie up at the first-rate, modern marina. Things to do: The attractions of cosmopolitan Athens are many. Naturally, climbing the hill to the summit of the plateau to view the ruins of the Acropolis, including the Parthenon, is an intriguing way to spend part of your day. Going early in the morning is the best option to avoid the crowds of tourists that flock to this impressive site. While you're there admiring the splendid views of Athens, check out the Acropolis Museum. The Olympieion (Temple of Olympian Zeus) and the Ancient Agora, home to the temples of Apollo and Hephaestus, are also very popular destinations. In downtown Athens, you'll find a dizzying array of museums, most of them along Vassilissis Sophias Avenue. Of particular interest is the National Archaeological Museum, which contains exhibits, displays, and artifacts from the Cycladic, Minoan, and Mycenaean civilizations, among others. Spending an evening wandering the narrow lanes of Plaka and enjoying a delicious dinner in a taverna is delightful. Sailing in Athens waters provides you with an opportunity to visit one of the most famous and historic cities in the world.